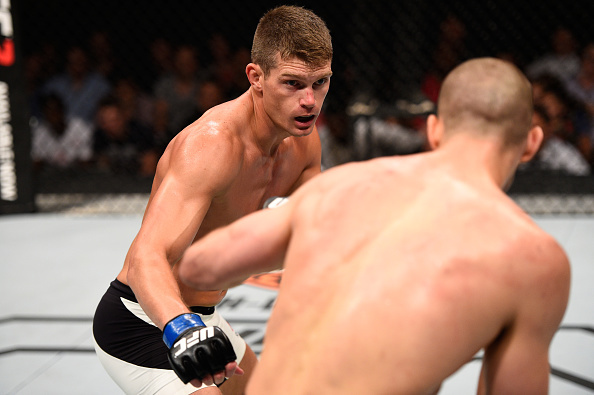 Stephen Thompson orchestrated a tactical five-round decision victory over Rory MacDonald to put himself next in line for a shot at the Welterweight gold, overcoming his Canadian counterpart in Ottawa. Far from the most exciting of battles, Wonderboy presented too much of a challenge for his opponent, with unique footwork and unorthodox angles causing a world of problems for MacDonald that even an urgent fifth-round bid couldn't solve. Prior to that, Donald Cerrone knocked out Patrick Côté in one of his finest career performances to date at the top of UFC Fight Night 89. Following a host of preliminary action highlighted by Krzysztof Jotko's stunning 59-second knockout of Tamdan McCrory, along with former title challenger Joe Soto submitting Chris Beal, history was in the making as the first Women's Flyweight fight was contested under the lights of the TD Place to begin the main card. Valérie Létourneau had the backing of fellow Canadians when she shared the Octagon with Scotland's Joanne Calderwood, but it wouldn't be enough to give her the victory as punishing body shots would eventually take their toll to conclude a competitive scrap. A spinning back fist landed flush in the first by the Scot, putting her close to getting the knockout but the heart of the former number one contender kept her in the contest. Some grappling up against the cage from JoJo and some damage by controlling up top would contribute to some lethal standup damage. Front kicks and other strikes to the body left Létourneau grimacing despite herself returning some accurate head kicks and jabs, before all would be too much as a final front kick made her turn her back towards her opponent, and some strikes chasing her backwards would end the fight. Another third-round finish would subsequently follow as the Canadians went wild for Olivier Aubin-Mercier, who wore down Thibault Gouti with suffocating grappling before a rear-naked choke midway through the final frame. On the feet, he did encounter some trouble in the early minutes, absorbing more strikes than his liking, but when the takedowns began to succeed, the writing was on the wall. Then, Steve Bosse and Sean O'Connell would get everyone up off their seats in an incredible three-round war. Canada's Bosse was down but not out in the first round after successive left hands by his opponent landed on the mark, managing to pull through and with some grappling see it to the end of the first round. In the second, it would be the American on the back foot, stumbled by shots after the two stood in the middle of the cage and traded bombs. Off balance, he went for a kick but was taken to the ground, and absorbed some pounding on the mat. Soon enough, he was able to recollect and get back to his feet, where there was more exchanges - and then five more minutes of action allocated. There were more riveting exchanges, a few spinning attempts and then the crowd really voiced up when they high-fived in the centre before trading more. Both were able to absorb one another's damage as they wobbled and looked to find a victory. This time, the judges would be needed as they went the distance - scoring it in favour of the Canadian Bosse, while giving the fans in attendance a fifteen-minute war that won't be forgotten. Donald Cerrone produced one of the best performances of his career as he outclassed Patrick Côté en route to a statement-making third-round knockout. "Cowboy" came out the blocks with two big double-leg takedowns, and came close in the later seconds of the first frame to submitting his opponent, taking his back and only just unable to secure a rear-naked choke. Leg kicks were certainly troubling the Canadian, and nullifying his movement which then opened up an opportunity for him to land a flush left hook and send Côté crashing to the mat. All he received in exchange were some strikes to the body, none which phased him as he remained in full flow, expressing his rejuvenated abilities at Welterweight. Another knockdown was scored in the third, in similar fashion as a hook sent the home fighter crashing backwards. Cerrone didn't want to follow him to the ground, and stepped away allowing the referee to stand it back up. More kicks in striking range and inch-perfect Muay Thai would open up for an exclamation mark on a spectacular performance. In the clinch, he landed two significant right hands, with Côté once again going down. He was followed by Donald, who unleashed some vicious ground-and-pound and that was it - a major splash in the waters of 170 pounds. Rory MacDonald made his long awaited return, just less than a year after he waged war with Robbie Lawler for the Welterweight strap at UFC 189, to a rapturous reception from the Canadian fans. The TD Place reached fever pitch ahead of one of the most highly anticipated matchups of the year, with "Wonderboy" the recipient of a much expected chorus of boos, being the American enemy at the other side of the Octagon. It was a relatively tentative start to the action, with more emphasis on the tactics as Thompson looked to keep the distance with side kicks to the body, while MacDonald attempted some leg rolls to try and secure a heel hook on two occasions in the first. There was some late clinching in what was more of a feeling out five minutes as "Let's go Rory" chants rung around the arena. While remaining respectful of the striking credentials of his opponent, the Canadian began to try and close the distance more in the second round. Side kicks and a few missed attempts including a question-mark attempt kept things cautious, with all taking place on a tactical level. MacDonald landed an elbow in the clinch after his takedown attempt was thwarted, but towards the end there were some more open exchanges - an indication that the contest was heating up. The Red King continued to press the pace in an attempt to restrict the space and movement of Wonderboy, landing a right hand on the chase as a reward for his efforts. MacDonald was looking to initiate the grappling as he crept into better range, and in the clinch Thompson was able to get the mount on the ground, but fled after a heel hook attempt. As the main event rounds ensued, MacDonald continued to control the centre as he stalked down Thompson, landing a few more shots and caught him circling. But there was some excellent counter-striking exercised by the American, who landed a few counter hooks and a side kick to the body. There were some more wilder exchanges in the earlier parts of the round but both remained patient with 5 minutes left of the fight. A renewed sense of urgency was clear from the Canadian as he charged forth and looked to unsettle his opponent. He was taking a risk but also got his rewards, landing some big strikes before then getting cracked with a wheel kick to the nose which left him pouring blood. There were further wild exchanges with neither men content with leaving the fight as it was. MacDonald then shot for a takedown but it ended with Thompson in side control, before it was stood up and the American was able to exercise more of his excellent angles, range-fighting and footwork to the final bell. The judges scorecards read 50-45, 50-45 and 48-47 all in favour of Wonderboy. It was more of a "chess match" as he would explain in his post-fight interview. That chess match mainly consisted of MacDonald charging forward into different combinations with the American well in his element.